Doctors Without Borders/Médecins Sans Frontières (MSF) has been combating Chagas disease since 1999 in a number of Latin American countries by providing access to diagnosis and treatment to people infected with this neglected parasitic disease. From 1999 to the beginning of 2011, a total of eight projects were implemented in Honduras, Nicaragua, Bolivia, Guatemala, Colombia, and Paraguay. During this period, MSF tested more than 80,000 people, diagnosed 6,185 and treated 4,160 with benznidazole (BZD) as a first-line option for treatment. Until recently, treatment with benznidazole was thought to be safe and effective only for the acute phase of Chagas disease. Then evidence began to emerge suggesting the benefits of treatment during the chronic phase as well. At the same time, greater political prioritization of Chagas treatment by the World Health Organization (WHO) and the Pan-American Health Organization (PAHO) encouraged countries to actively tackle the disease with screening, diagnosis, and etiological treatment for all children and all adults. Just as this promising turn of events unfolded, however, a major shortage of benznidazole threatened to halt the progress and leave patients without access to the primary treatment against Chagas disease. Already, MSF’s program in Paraguay has been forced to suspend diagnosis of new patients in a bid to mitigate the effects of the shortage. In Bolivia, stocks will run out early 2012. All plans for new projects have been put on hold. This crisis could have been prevented but the major player involved, the Brazilian Ministry of Health, has shirked its responsibilities and is evidently unwilling to overcome the various challenges. 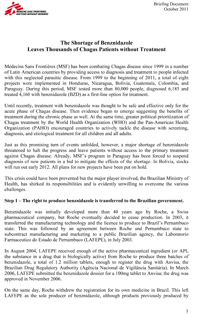 Step 1 – The right to produce benznidazole is transferred to the Brazilian government. Benznidazole was initially developed more than 40 years ago by Roche, a Swiss pharmaceutical company, but Roche eventually decided to cease production. In 2003, it transferred the manufacturing technology and the licence to produce to Brazil’s Pernambuco state. This was followed by an agreement between Roche and Pernambuco state to subcontract manufacturing and marketing to a public Brazilian agency, the Laboratorio Farmaceutico do Estado de Pernambuco (LAFEPE), in July 2003. In August 2004, LAFEPE received enough of the active pharmaceutical ingredient (or API, the substance in a drug that is biologically active) from Roche to produce three batches of benznidazole, a total of 1.2 million tablets, enough to register the drug with Anvisa, the Brazilian Drug Regulatory Authority (Agência Nacional de Vigilância Sanitária). In March 2006, LAFEPE submitted the benznidazole dossier for a 100mg tablet to Anvisa; the drug was approved in November 2006. On the same day, Roche withdrew the registration for its own medicine in Brazil. This left LAFEPE as the sole producer of benznidazole, although products previously produced by Roche continued to be available until their expiration date, with stocks available up to October 2010. Even though LAFEPE had the capacity to produce benznidazole, it did not do so for logistical issues—including the distribution of the drug to all the countries and the registration of the product in other countries—nor was it supported by the Ministry of Health to do so. Step 2 – LAFEPE identified a new source for the active pharmaceutical ingredient (API) necessary to make benznidazole. After Roche began to cease production, a new source of active pharmaceutical ingredient (API) was needed. A private Brazilian company called Nortec Química was identified to produce the API necessary for the production of benznidazole once the Roche stock ran out. To bridge any potential shortfall, Roche provided further quantities of the API. By 2010, Nortec Química was technically able to produce the API in its own facility, following documentation provided by Roche at the laboratory level. Nortec is today the only producer of the API for benznidazole worldwide. Nevertheless, full-scale production of the API had just begun since the initial orders for the product were only made at a late stage. Step 3 – Clear signs showed that the demand for benznidazole was set to increase. Initially, treatment with benznidazole was intended only for people in the acute phase of the disease. However, evidence has proven the benefits of treatment for patients who are asymptomatic, in the acute and chronic phases, as well as patients up to the age of 60 years. There is already evidence that etiological treatment of those chronically infected with mild cardiovascular symptoms can delay the progression of the disease, and more quantitative results will be published next year from the BENEFIT multi-centric study. It has also been confirmed that those treated with benznidazole within three months of infection have the best chance of cure (between 90 and 100%). In its programs, MSF has shown that patients in both the acute and chronic phases could be treated, provided regular medical checks were performed. A 2009 review in the medical journal PLoS Neglected Tropical Diseases of MSF’s experience with Chagas over a ten year period showed that the etiological treatment of children and adolescents was indeed viable, and that treatment of adults is safe. This evidence was a clear signal that demand for benznidazole would increase as it became clear the drug was an option for many more patients. Because demand for benznidazole depends on active engagement by Chagas control programs, MSF and the Drugs for Neglected Diseases Initiative (DNDi) launched campaigns to raise awareness of Chagas disease and stimulate demand from countries in order to facilitate demand forecasting. At the same time, various bodies were making Chagas treatment more of a priority, promising to put an end to the neglect of Chagas disease, and thereby boosting demand for benznidazole treatment. Resolutions adopted by the WHO and PAHO have catalyzed the response to the disease in a host of different countries. In 2009, for instance, PAHO passed a landmark resolution entitled “Elimination of Neglected Diseases and Other Poverty-Related Infections.” It recommended the provision of etiological treatment to all children with Chagas disease, the integration of Chagas diagnosis in the primary healthcare system, and the extension of care to adults where possible. Several countries have implemented these guidelines. Bolivia, the country with the highest Chagas burden in the world, now recommends that all persons up to the age of 60 who are diagnosed with the disease should be offered treatment. Groups of patients living with the disease, in both endemic and non-endemic countries, have also increased their mobilization for access to etiological treatment. Yet just as signs of a future surge in demand for Chagas treatment appeared, the production of benznidazole became even more tenuous. Step 4 - Finalization of the new API source drew to a standstill, even as the clock ticked before Roche’s API and drugs expired. A new source of API had been identified, and the new producer developed the capacity to produce it. But there were still difficulties before the generalized production of benznidazole could be switched to the new source. Stability studies were necessary both for the API itself and the finished product made with the new API, and the regulatory agency needed time to approve the dossier. The estimated timeframe varied from 10 to 12 months. This is the entirely legitimate minimum required time by most regulatory authorities for the validation of a change in the source of API for a product. Had the Brazilian Ministry of Health cooperated according to plan, there would have been a new API approved and available without an interruption to the production of benznidazole. Yet despite the urgency of finalizing Nortec as the new source for the API before Roche’s products expired, little progress was made on this front. There was no effective direction from the Brazilian Ministry of Health, and there was insufficient demand forecasting from PAHO and other countries’ Ministries of Health. Step 5 - All purchasers of benznidazole turn to LAFEPE as Roche’s remaining stocks expired. In October 2010, the last batches of benznidazole produced by Roche expired. From then on, the only source of benznidazole was LAFEPE’s own production using Roche’s active pharmaceutical ingredient. But because this had also expired, the threat of a global shortage of benznidazole immediately began to surface. LAFEPE first informed MSF that a batch of new tablets using the expired Roche API, subsequently re-processed by Nortec, would be available as temporary solution by October 2010. The production of the new batch was postponed several times, and was eventually delayed until early 2011, due to Nortec's miscalculation of the time this process would take. The scramble for other stopgap solutions began. When the Brazilian Ministry of Health returned over half a million unused tablets, they offered to sell them to MSF. But given the time it took to authorize the purchase and organize shipment to MSF projects, customs authorities refused to allow the treatments to enter the country because the expiration date was too near. Step 6 – Orders for benznidazole were unmet and contingency measures need to be put in place. This summer, LAFEPE informed MSF that it will not be able to meet the orders for 460,000 tablets for MSF projects in Bolivia and 360,000 tablets for MSF projects in Paraguay. MSF projects received the last batch of 78,000 benznidazole tablets in Bolivia and 35,000 tablets in Colombia, enough to last until December 2011. In MSF programs, contingency measures have now been put in place to deal with the crisis. Teams in Paraguay cannot diagnose any new patients because they would not be able to start treatment. The stocks of benznidazole in Bolivia will run out early next year. And no new project can open until the supply problems are resolved. In recent years, numerous signals have made it clear that a shortage of benznidazole was a crisis waiting to happen. A working group including the Ministry of Health, LAFEPE, Nortec, PAHO and the DNDi was created before the crisis ostensibly to ensure smooth production and coordination between all actors for the benznidazole paediatric formulation. Unfortunately, this group did not remain functional. MSF had reached out on several occasions to the Brazilian Ministry of Health to warn of the looming shortage, and to demand action once it became clear a shortage was inevitable – most recently last month. Resolution of this crisis will only be possible if the different parties involved stop blaming each other. In successive communications with MSF, LAFEPE has blamed Nortec for failing to deliver the API, while Nortec has blamed LAFEPE for failing to make precise orders. Both companies have blamed the Ministry of Health for not unblocking the funds in a timely fashion. In its latest communication with MSF, the Ministry of Health again shifted the blame onto LAFEPE. The Ministry of Health has taken the responsibility of being the sole producer of benznidazole. It must now show strong leadership in solving the benznidazole shortage. Publicly clarify the extent of the supply shortage. Notify all treatment providers and groups of patients living with the disease. Lead a contingency plan for rational use of benznidazole at the regional level, in partnership with PAHO, to manage the remaining stocks. Such a plan should include prioritizing the most vulnerable groups in most prevalent endemic countries. Immediately commit to accelerating the current process for the production of benznidazole and assume coordination role between all actors. Guarantee long-term and sustainable production of benznidazole. Guarantee the price of the product, regardless of cost of the API. Communicate a transparent production schedule. Expedite the validation of the active ingredient produced by Nortec via ANVISA (the Brazilian regulatory agency). Explore, in the medium-term, the possibility of additional producers to mitigate the dependence on a single supplier of API. Support the creation of a working group or “emergency mechanism” to help countries within the PAHO region form contingency plans for the rational use of benznidazole and to coordinate available stock. Continue to facilitate demand forecasts and the use of a Rotation Fund for the purchase of benznidazole and its delivery. Facilitate at a country level the importation of benznidazole. Facilitate benznidazole’s placement on the Essential Drug List for countries where Chagas is endemic.